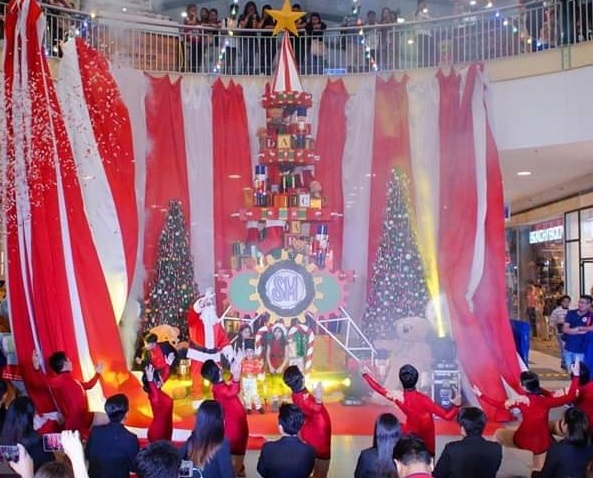 Christmas shopping experience was made more fun as SM Malls in the province of Batangas unveiled its Christmas centerpieces for this year. SM City Lipa highlighted its carnival-themed Christmas park last November 9 at the mall’s Events Center, while SM Batangas brought to light its toy factory-themed centerpiece last November 10. SM Lemery on the other hand, featured Santa’s magical sleigh ride last November 11. Performances of various artists and Christmas characters together with confetti showers made the unveiling more festive and joyful. The SM Christmas Centerpieces will be on display until January 10, 2019. The Christmas attractions which will be on display until January 10 are sure to delight shoppers of the different SM Malls in Batangas. On top, is the Christmas toy factory-themed centerpiece of SM Batangas. On the middle is the carnival-themed Christmas park of SM Lipa, while SM Lemery features Santa’s magical sleigh. Christmas and carnival characters greeted the audience as SM Lipa unveiled its Christmas centerpiece. Performers sang and dance as SM Batanga unveiled its toy factory-themed Christmas Centerpiece located at the mall’s atrium. Christmas elves danced as SM Lemery unveiled its magical sleigh located at the ground floor of SM Center Lemery. This is also the time for the much awaited Grand Christmas Parade which will happen on November 24 and December 28 at SM City Lipa; December 1 and 21 at SM City Batangas; and December 9 at SM Center Lemery.